A bicycle repair business can be a reliable source of income for individuals who are passionate about bikes and great with their hands. With over 100 million Americans who own bikes, the demand for bike repair services remains higher than ever. According to data from the National Household Travel Survey, the number of commuting and leisure trips by bicycle exceeds four billion each year. In addition, activities such as competitive cycling, motorbiking, and racing clubs ensure that the need for competent repair professionals will continue to grow. However, rapidly changing technology and demographic needs may require potential business owners to plan extensively in order to succeed. A look at the most important considerations for starting a bicycle repair business can help give you the best return on your time and investment required to launch your business. Starting a bicycle repair business requires a solid business plan. For starters, you should outline your business goals and financial goals. These goals include how many hours you wish to operate your business per week, existing tools you work with and those you need to learn, and the location range in which you wish to work. In addition, you should establish contacts with bicycling clubs and organizations in your area to receive the latest news and obtain potential customer leads. By signing up for newsletters and picking up business cards, you can have an immediate client base upon announcing the grand opening of your business. Traditionally, bicycle repair services operated as home-based or garage shops. However, mobile repair services represent the future of bicycle repair. Instead of limiting yourself to a 20-mile radius and waiting for customers to come to you, a mobile bike repair business allows you to drive to any customer and service their bike on-site. Mobile services allow you to set flexible operating hours, serve a broader geographical area, and carry much-needed equipment with you at all times. However, operating a mobile business also requires investment in a reliable truck and fuel costs. If you plan to run a mobile business, be sure to factor in truck operation to ensure your investment pays off. One of the top benefits of starting a bicycle repair business is the low start-up cost. At the minimum, you will need to calculate costs to register as an limited liability corporation (LLC) or other form of incorporation. Running a side business requires home office with accounting software to keep a record of sales and customers. In addition, you will need basic bicycle repair equipment and tools. Finally, if you wish to start a mobile business, the cost of a box truck or van will increase your start-up expenses. For a stationary bicycle repair business, you may start with as little as $1,000 of your own funding. If you need help purchasing a box truck or van for your mobile business, you may consider financing through a credit union, peer lending group, or crowdfunding service. Standard resources and materials needed to start a repair business include internal record-keeping software and copies of business registration. 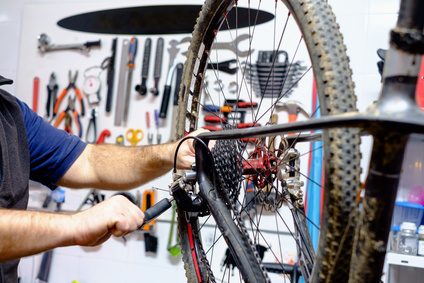 Because bicycle repair is a hands-on business, you will also need appropriate equipment such as a permanent toolkit, repair stands, wrenches, and storage. You may also need to stock up on special tools such as a ratchet set, tire pump, or truing stand. Subscriptions to the current cycling newsletters or magazines can also keep you updated on the latest repair equipment. Signing up for training can potentially improve your technique and create a more efficient bicycle repair business. Consider taking a bicycle repair certification course at your local community college or trade school. Other relevant courses include wheel and axle seminars, mechanics, and shop construction. These certifications help bring credibility to your business, and you can also display the certificates to reassure customers of your expertise. In addition, you may wish to consider an apprenticeship at a local bike shop. Organizations such as the National Bicycle Dealers Association often provides listings and contact information. Be sure to follow state and local laws for holding a business license and paying business taxes. For example, some states require sales tax on every service transaction, and others require a quarterly payment on income. If your state requires business insurance, make sure you have an insurance plan in place before launch. You should also consider business zone rules for parking and operating a truck for a mobile repair business. Whereas a stand-alone business may require a Certificate of Occupancy (CO), mobile bike repair businesses may require a truck permit. Verify the rules for your area to prevent any unpleasant surprises down the road. Once you have prepared your resources, it is simple to launch your business. Outline a list of services that may include diagnosing bike problems, repairing or replacing damaged parts, and rebuilding bikes for regular use. Market your business as the go-to service for anyone needing a bike tune-up. You may wish to set up a business website with appointment-booking software, or simply distribute your business contact phone numbers so that potential customers can schedule repair services. Bicycle repair businesses have numerous marketing outlets to help ensure success. Some of the most important marketing resources are connections to cycling clubs and bicycle groups. Prepare business cards, attend meetings, and list your business in cycling newsletters and classifieds. Once you establish your reputation as a bike guru, your business can continue to grow by word of mouth. In addition, consider posting your business in free online listings such as Craigslist and Google Business. Operational concerns for bike repair businesses include internal order management as well as daily work operations. Home business software can help you keep track of orders and keep records for tax time. For both mobile and stationary businesses, you should have a payment processor in place that accepts various forms of payment, including credit cards and PayPal. Requiring customers to sign a “Terms of Service” document and receipts can provide solid written records that protect your business. For daily operations, you should establish straightforward repair stations for smooth workflow. This is especially important in mobile business with limited space. Finally, routine equipment maintenance can save you time and money in the long run. Potential for growth is one of the key benefits of starting a bike repair business. Once you have a few sales, you can market yourself through biking associations. Request that previous customers leave positive reviews on sites like Yelp, Google Reviews, or your business website. In addition, you can spread the word at cycling competitions, mountain biking trails, motorbike festivals, and bike safety shows. When marketing yourself at these events, offer incentives such as coupons or military discounts to encourage customers to choose your repair service. Speaking of coupons, you can also post your coupon codes on sites such as Groupon or Angie’s List to increase exposure for your business. Another option is to create a referral program or contest to encourage bike owners to refer friends to your business. This can help you get consistent business leads and establish and steady stream of income. Bicycle repair businesses also offer numerous opportunities for expansion. In addition to charging a set rate for bike tune-ups, you can eventually host workshops or sell refurbished bikes at discounts. Top-earning repair businesses may purchase additional trucks and hire employees. With the high number of bicycling enthusiasts available, your bicycle repair side business can provide revenue opportunities for years to come.